07.30am – Double Shot coffee time on the way to the Boat! 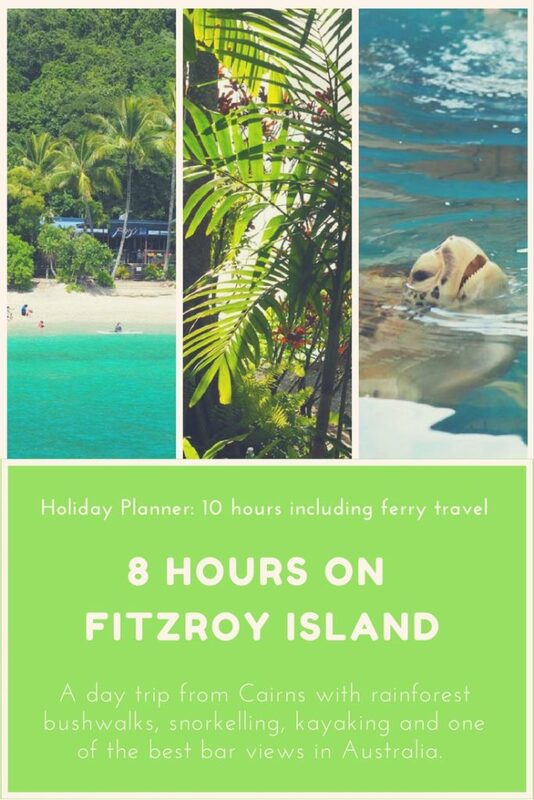 It’s worth getting out of bed early to have a full 8 hours on Fitzroy Island so book on to the 8am ferry. Head to berth 20 on the Marlin Wharf. 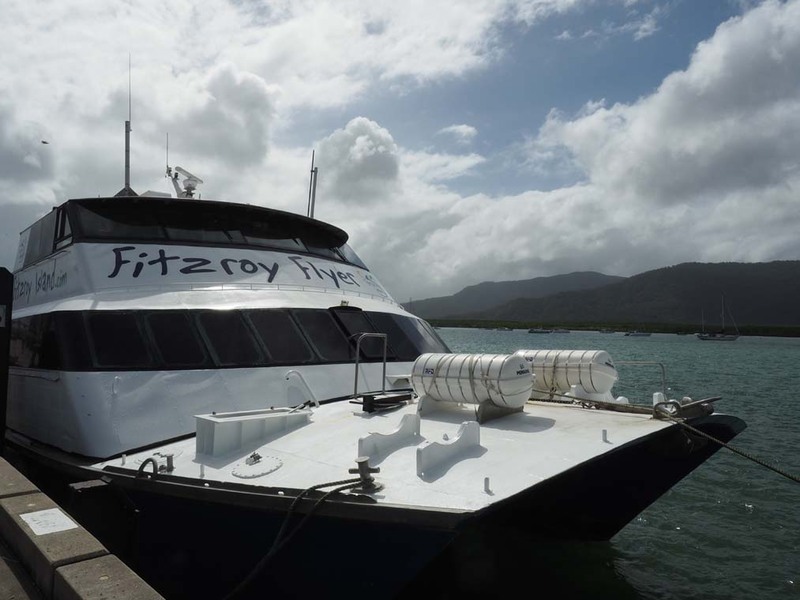 The Fitzroy Island Flyer (the ferry) leaves from the end of the Wharf so make sure you allow plenty of time to walk to the boat. Sit up stairs to make the most of the fresh air and views of the Queensland coast. 8.00 Wave goodbye to Cairns! The Cairns Marine is a picturesque place rain, hail or shine, offering up the chance to ogle other peoples expensive catamarans and take in the views of the surrounding mountains. The boat staff usually have maps of the island available or you can collect one from the Fitzroy Island staff member who greets you on arrival at the island. 9.00 Book in for your turtle tour! If your super keen to go on a Turtle tours you need to do this first as there are very limited spaces. Head to the general store to make a reservation. They do book out quickly so if you miss out don’t let it stress you out. Alternatively snorkel out the front of the turtle centre near white rock for a chance to swim with wild turtles! Only 3.8km km in length but around 2.5 hours to complete this bushwalk is a fairly grueling uphill climb! It can be done as either a return or circuit walk and about 2/3 of the way up the mountain you start to be rewarded for your effort with views out over the azure ocean below. Stop for a break and a snack on my favourite rock partway up. 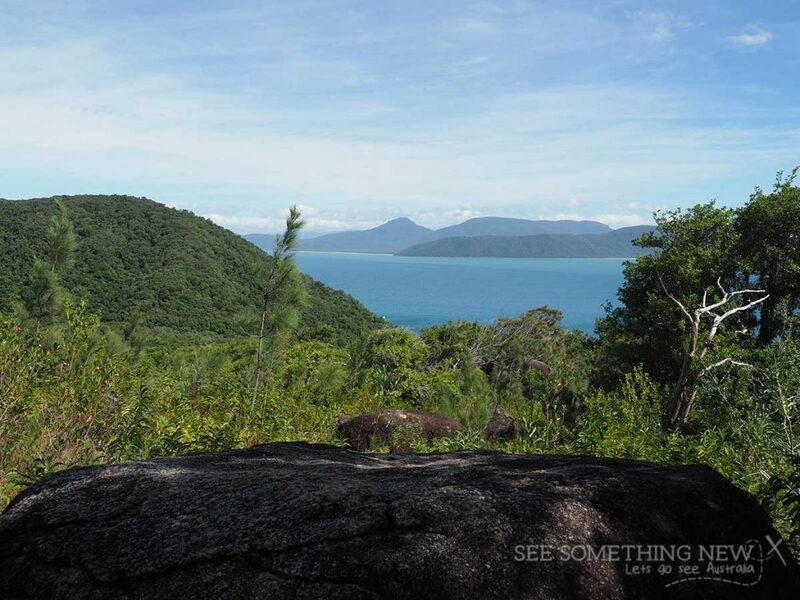 I love this part of the walk because you are high enough to get perspective but still feel like you are part of the landscape, surrounded by the Fitzroy Island National Park. Continue to the viewing platform at the very top of the summit for stunning views out over the island, fringing reef and mainland. From here you can return back down the stairs or continue on the loop, walking down a very steep vehicle track. If you head this way you also have the option to detour to the lighthouse. 9.15am Head to the CDC dive shop on the Island to book a place on the 1000 Glass Bottom Boat Wet Tour. This morning ‘wet’ tour is longer and includes a snorkel as well as the glass bottom boat for the same price as the dry tour. It includes the free use of snorkel gear which you must collect from the dive store prior to departure. 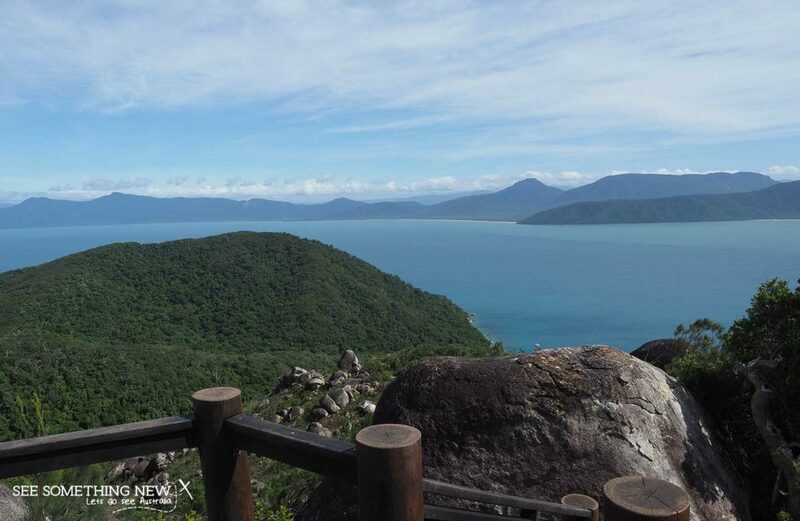 The tour location is tide dependent but stops over the fringing coral reef to teach you some of the basics of the reef biology before continuing on to a more secluded snorkelling spot than the main Fitzroy Island bay. Both short walks, the Nudey Beach track and secret garden walks are shorter alternatives or good add-ons after the summit for the super motivated. A sneak peak of Nudey Beach before you climb down onto the white coral. Nudey beach is a coral beach which has been voted one of the best beaches in Australia (although I usually find it fairly windy). 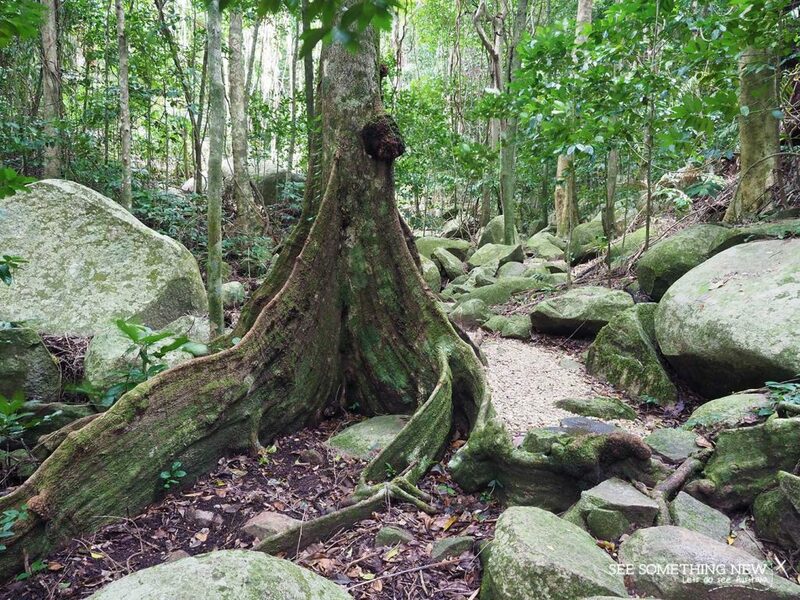 The secret garden track meanders through the rainforest, past vines, massive tree roots and huge trees. Foxys is casual beachfront dining and serves a range of pub meals and salads. They are open from 10am for drinks and from 12-3 for lunch. If you booked in a turtle tour you will need to schedule your beach time in around it. If not it’s time to hit the water and look for wild turtles. Hire kayaks, snorkel or stand up paddle boards from the Resort CDC Dive shop or Raging Thunder Beach Shack and hit the beautiful aqua blue water. Snorkel higher tides around white rock for the chance to spot turtles, if its low tide you will need to enter at the jetty and snorkel along to avoid damaging the reef on entry. Just remember its harder work snorkelling back again so save some energy for the return journey and make sure you hire flippers which make it much easier. Turtles cruise the shallower waters near white rock so keep your eye out and if you’re lucky you may spot one! There are also some clown fish (but not the same species as nemo) on this end of the reef almost directly in line with the rock and about 40 metres out. For lower tides snorkel the rocks at the southern end of Welcome Bay. This slightly deeper section of reef becomes more accessible at this time of day. Finally embrace your inner kid and spend some time jumping off the ocean trampoline before heading back to Foxy’s for a farewell beverage. By now you should be all tuckered out from bushwalking, snorkeling & paddling explorations of the Island so it’s time for that well earned drink. 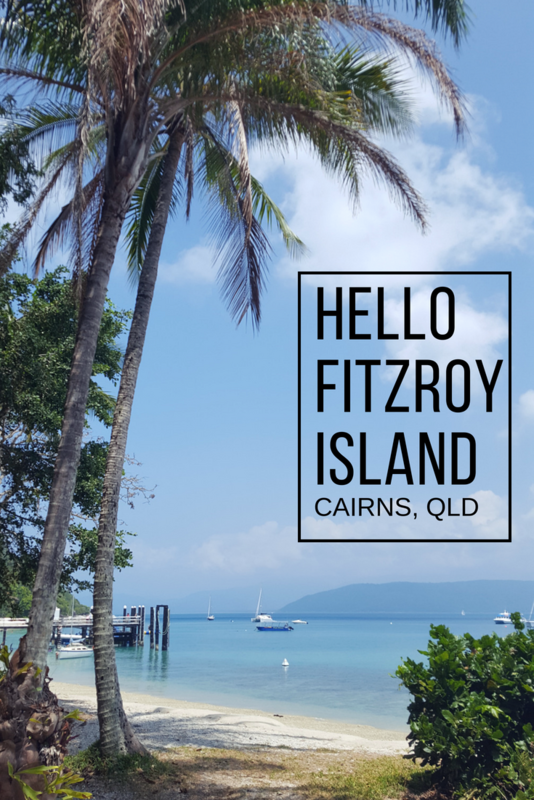 In my opinion Fitzroy Islands Foxys Bar has one of the best bar views in Australia so it’s the perfect spot to enjoy a beverage or two before boarding the boat for your trip back to cairns. 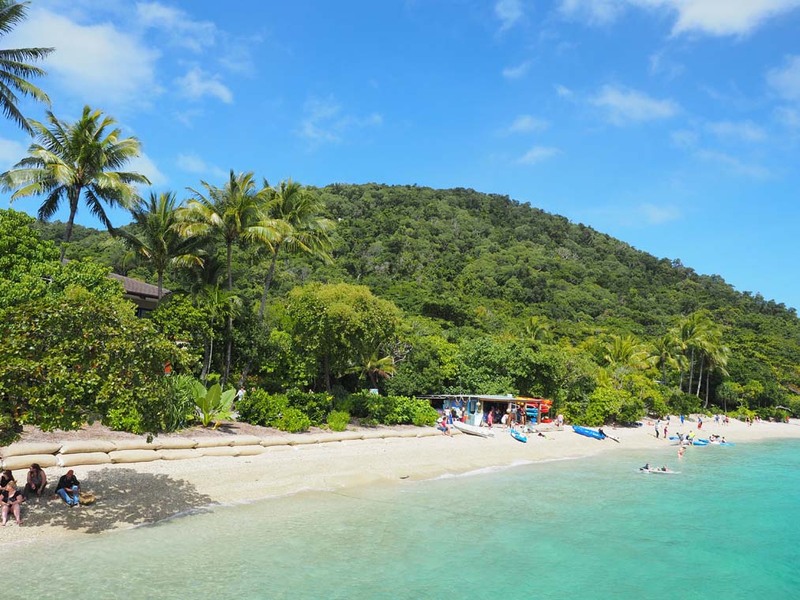 Foxy’s Bar on Fitzroy Island may just have Australia’s best bar view! The beach is made from Coral not sand so if you own beach shoes they are a good idea, especially for small children. The resort facilities are reserved for resort guests so that they can enjoy their facilities crowd free. If you would like to use the swim up bar or other facilities book to stay overnight – its worth it just to watch the sunset from the island. Sea Sickness – don’t let it ruin your day. There is a part of the journey that can get a little rough so if you get sea sick take your tablets at least 30 minutes prior to travelling. Not planning a trip to Queensland yet? Pin this to your holiday board for future reference! 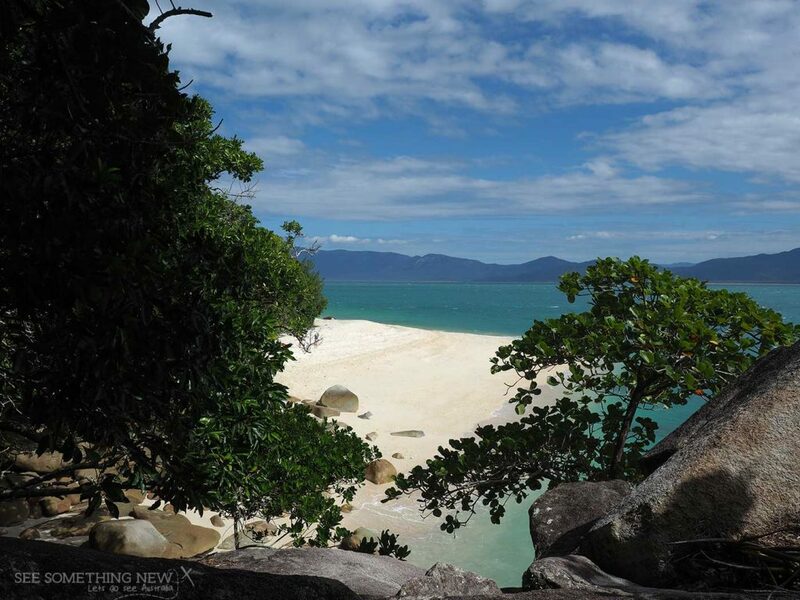 A day trip to Fitzroy Island Cairns where the “rainforest meets the reef”.